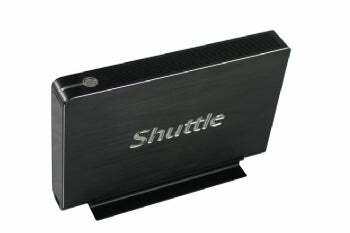 Shuttle, known for making small-form-factor desktop PCs, announced today (on its European site) the Shuttle Barebone XS35, a mini PC that's less than 1.5 inches wide. Powering the XS35 is the Intel Atom D510 Dual Core Processor (2x 1.66 GHz) and a high-performance NVIDIA GT218 as the system's graphics card. The XS35 is passively cooled, increasing the energy efficiency of the system and making it whisper-quiet. In terms of connectors, the XS35 sports a host of practical options including HDMI, VGA, five USB ports, ethernet, audio, and a multi-format card reader. It's HD-ready out-of-the box and is compliant with the VESA standardized mounting interface, so the XS35's small size makes it perfect for mounting behind flat panel displays. The XS35 will be available in the second quarter of 2010 in Europe. No retail price has been set, much less a roll-out date for the American market. However, if you're happen to be attending the CeBIT technology expo next week in Germany, you can check out the XS35 at Shuttle's booth. What would you do with a thin, energy-efficient mini-PC? Make it the brains behind a robotic, roving TV stand? Power a wall of HD displays? Post your ideas in the comments.